So, I made this weapon based upon the principle of Brownian movement. 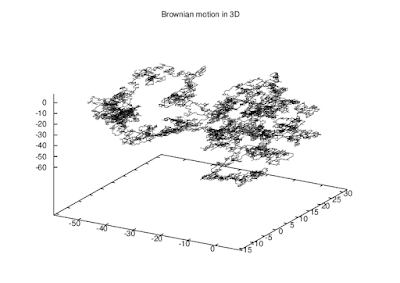 Brownian movement models can be used to predict the concentration of particles in a confined spaces, or the possible behavior of large groups of data points. If you are a math nerd (not me), or someone who wishes they were a math nerd (me), I have included an explanation of how I came up with the stuff for the Scarves/Eneedru at the bottom of the page. If math doesn't interest you, no worries, the explanation has no real impact on the use of the item in your games! 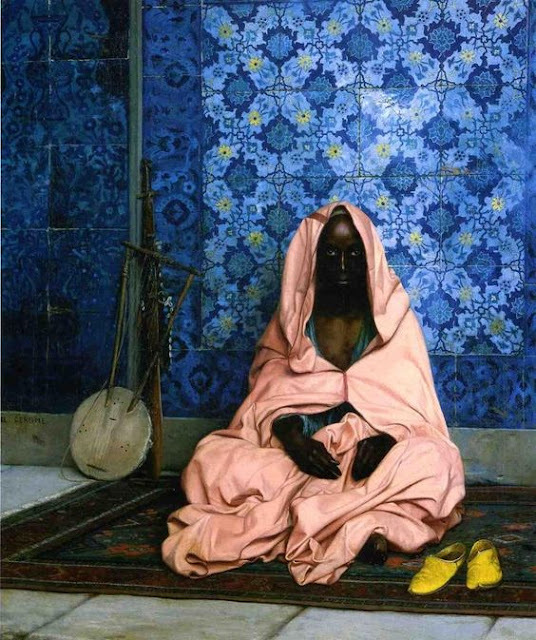 A male member of the Sicarii resting. Our scarves (Eneedru) are the breath of Jaih, scalding without heat, cutting without edge. - Line 374 of the Sicarii Fragments. Murderers and artists, dancers and bloodletters, the Sicarii Jaih brought grace and art to the death they gave. Each was trained to weave their weapons, called Eneedru, into a dance that surrounded them with gray bands of cloud. Steps were unique to each dancer, though if possessed of the knowledge, one could identify which house trained them. Dancers would wear bells as they wove their weapon into art, the rhythmic movements creating a sort of song that was as unique to the dancer as the dance itself. Their lethal dance was called the Tandallum, the dance of culling that the universe continuously moves to. 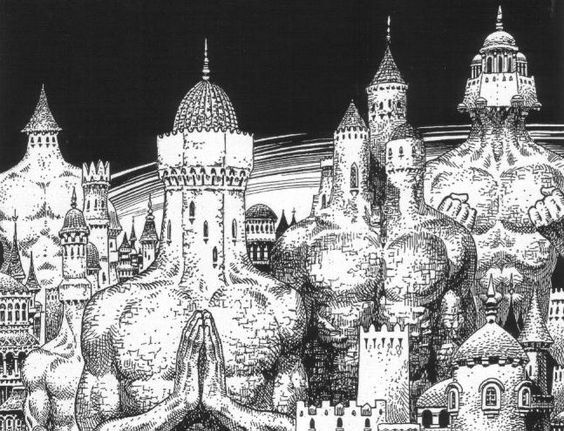 While no mere singular being, be they god or mortal, could reproduce the Tandallum perfectly, each unique dance of every dancer sought to, in some way, ape the universal culling movement. A Sicarii wearing a bejeweled pair of Eneedru gloves. The Eneedru that the Sicarii Jaih wielded were things of gray smoke contained within rings and bracelets connected by chains. When loosed from the gloves, the gray smoke dances between the hands of the wielder, swirling and flowing like a scarf. Eneedru are capable of creating wounds that can range from minor to lethal, depending on the thickness of the smoke that 'struck' the target. Much like their arrows, the gloves of the Sicarii Jaih have outlived the memory of their makers. Within the Sicarii Fragments is a guide to the basics of the Tandallum, though true mastery has been lost with much of the history of the Sicarii. Depending on the concentration of the smoke that strikes the target, different levels of damage can occur. To translate this concept into game mechanics, the smoke has the ability to do minor damage (1D4) to lethal damage (1D12). The probability spread is based upon one dimensional Brownian movement. Notes: This weapon is complicated, but it can be fun. So, each time the character successfully strikes an opponent, roll 1D100 and consult the info above, that's the damage die used. The 'smoke' is actually a moveable field filled with gray particles that rasp away anything in their path like a sandblaster. 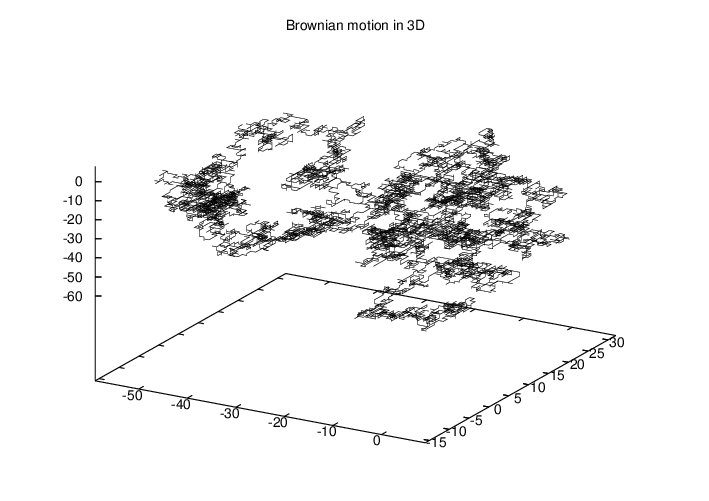 An example of 3 Dimensional Brownian Motion. With the Scarf/Endeeru, the gray particles that make up the 'smoke' are 330 picometers that are thrown about with incredible force. The weapon is a sand-blaster that is sharper than a razor, which has a width of 101 Million picometers wide. The particles conglomerate in masses like smoke, with each particle moving around randomly (Brownian Movement) with a speed of 400 m/s. The force of each particle is enough to easily rasp away skin and bone.